True to my word I started meal planning this week. The Pinterest inspiration that I saw involved colour coded cue cards in 10 different colours for 10 weeks of meal plans. There was a grocery list attached to the top, so in theory one would just have to grab a stack head out to the grocery store and one would be set for the week. This would work swimmingly if one was, a. Martha Stewart or b. Crazy OCD like the Boy, or c. actually devoted an weekend to planning 10 weeks of meals, printing them on colour coded cue cards, printed out the corresponding grocery lists and then displayed them beautifully for their esthetic beauty and to be showy about how ridiculously organized one was. So I thought I’d start small, one week at a time. I have done this before, but the lovely Pinterest post did highlight one small detail for me – save the lists. Brilliant. Week One was done on the fly while the Boy was in the shower 10 minutes pre-grocery shopping. I grabbed everything from some of (mostly one of) my favourite veggie blogs – ran through what we had already in the fridge (nothing) and in the pantry (surprisingly a lot) and off we went. The only item we’re short – I didn’t buy enough Basil which will require a grocery stop tonight. No biggie. For those that may be following along, I give you Week 1. Sundried Tomato Pesto Pasta – Oh She Glows – yummy, quick and easy. Loaded Baked Potato Soup – Peas and Thank You – I made this last night and after taking another look at the ingredients – 1 cup of cheese into the pot, plus more on top? That is loaded. I don’t think so Mama Pea. I skipped the 1 cup mixin’ and just added someme shredded on top. I’ll be sure to report back. Lentil Loaf – Oh She Glows – I make these in mini-loaf pans, then we can have 1 each for dinner and the other 8 go in the freezer for lunches (mostly mine – the Boy generally takes leftovers from dinner the night before) – but since we didn’t make it through all the recipes this week, I’ll probably push them over to next week. I’ve found soup in the fridge to be my saving grace so far. One pot goes sooo far when you’re feeding 2 people (or 2 people and a very little person). Plus it’s really cheap and easy. Win-win-win. I take a medium size mason jar to work (about 500ml) and it’s good for 2 lunches, which is two less lunches to pack each week. Bonus. 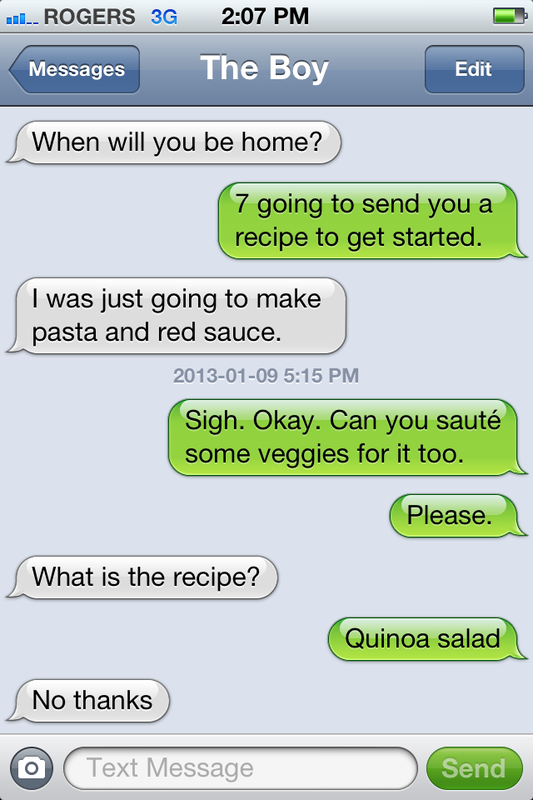 Pete and I both enjoyed this post and Boy’s response about the (delicious, I’m sure) quinoa salad. That guy. What a guy. Also, I’m going to steal some of these recipes. You need to record these conversations. I often threaten to do this. I made the lentil loaf the other day, but I added bacon. I probably shouldn’t add bacon to vegan recipes but I had extra bacon leftoever from my pea soup and I just can’t waste bacon. Anyway, it was pretty yummy and my mom looooved it. Oh She Glows has a lot of great recipes. Thanks for sharing! Dear Meaghan—you are awesome. I love that you are doing this!